The Options Analysis are used to evaluate several different option strikes, premiums and then show the range of outcomes for each option with various futures prices. A comparison is also made to the forward price that is offered on the date the option comparision analysis is made. An addition, the crop revenue insurance floor may also be shown. To go to the Options Analysis page click on this link. The options worksheets are provided to help producers walk through the mechanics of how options create a floor price. Using futures prices, local basis and option premiums to calculate today's floor as well as examples of a higher or lower market. These worksheets are blank templates that can be printed and used by you to evaluate the current scenario. Watch for recent options worksheets or options analysis files to be provided here. These examples from the summer of 2008 provide a look back at how options create a price floor and could have been used to protect against falling prices. These options worksheets show examples how we looked at the mechanics of using the respective puts or calls options during the summer of 2008. The options analysis is used to evaluate several different options and show the range of outcomes for each option with various futures prices. Put options are used to protect price with out a delivery committment. These examples of put analysis are from July 21, 2008. The call option analysis show how to keep upside price open after making a physical sale. These examples of call analysis are from May 23, 2008. A producer of a commodity would be a buyer of options if he/she wishes to protect from price decrease (buy put) or benefit from a price increase (buy call). An option to sell a futures contract is a put option. The buyer of a put option purchases the right to sell futures. The writer (seller) of the put option must buy futures (take the opposite side of the futures transaction) if the buyer exercises the option. For the right to exercise the option, the buyer pays the seller a premium. The buyer of a put option will make money if the futures price falls below the strike price. If the decline is more than the cost of the premium and transaction, the buyer has a net gain. The seller of a put option loses money if the futures price falls below the strike price. If the decline is more than the income from the premium less the cost of the transaction, the seller has a net loss. An option to buy a futures contract is a call option. The buyer of a call option purchases the right to buy futures. The seller (writer) of the call option must sell futures (take the opposite side of the futures transaction) if the buyer exercises the option. For the right to exercise the option, the buyer pays the seller a premium. The buyer of a call option will make money if the futures price rises above the strike price. If the rise is more than the cost of the premium and transaction, the buyer has a net gain. The seller of a call option loses money if the futures price rises above the strike price. If the rise is more than the income from the premium less the cost of the transaction, the seller has a net loss. Iowa State University options education files are provided for your review. Some advanced option strategies are included in these Iowa State University options education files. An option is the right, but not the obligation, to buy or sell a futures contract. The buyer of an option acquires this right. The option seller (writer) must take the opposite side of the option buyer's futures position. For example, if you buy an option with the right to buy futures, the option seller (writer) must sell futures to you if you exercise the option. Option contracts are traded in a similar manner as their underlying futures contracts. All buying and selling occurs by open outcry of competitive bids and offers in the trading pit. If you buy an option to buy futures, you own a call option. If you buy an option to sell futures, you own a put option. Call and put options are separate and distinct options. Calls and puts are not opposite sides of the same transaction. When buying or selling an option, you must choose from a set of predetermined price levels at which you will enter the futures market if the option is exercised. These are called strike prices. For example, if you choose a soybean option with a strike price of $9 per bushel, upon exercising the option you will buy or sell futures for $9. This will occur regardless of the current level of futures price. Strike prices are listed in predetermined price levels for each commodity: every 25 cents for soybeans, and 10 cents for corn. The amount paid for an option is the premium. The option buyer pays the premium to the option writer (seller) at the time of the option transaction. The premium is the only part of the option contract that is negotiated. All other contract terms are predetermined. The premium is the maximum amount the option buyer can lose and the maximum amount the option seller can make. When buying an option you must choose which delivery month you want. Options have the same delivery months as the underlying futures contracts. For example, corn options have December, March, May, July, and September delivery months, the same as corn futures. 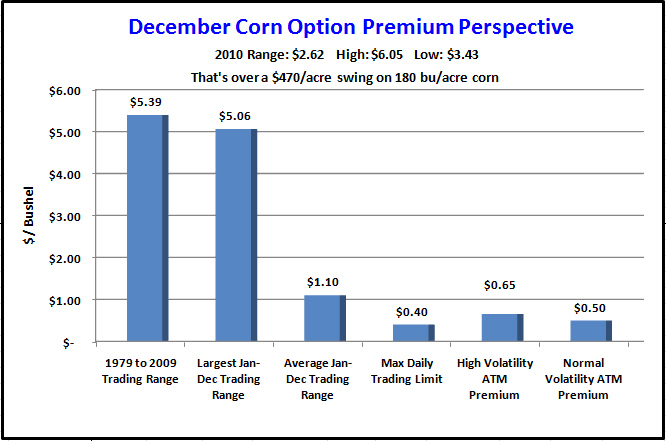 If you exercise a December corn option you will buy or sell December futures. There are three ways you can close out an option position. The option can be exercised, it can be sold, or the option can be allowed to expire. Exercising an option converts the option into a futures position at the strike price. Only the option buyer can exercise an option. When a call option is exercised, the option buyer buys futures at the strike price. The option writer (seller) takes the opposite side (sell) of the futures position at the strike price. When a put option is exercised, the option buyer sells futures at the strike price. The option writer (seller) takes the opposite side (buy) of the futures position. Because of the option seller's obligation to take a futures position if the option is exercised, he/she must post margin money and is faced with the possibility of margin calls. If you have already purchased an option, you can offset this position by selling another option with the same strike price and delivery month. You are now out of the options market. The amount of gain or loss from the transaction depends on the premium you paid when you purchased the option and the premium you received when you sold the option, less the transaction cost. An option expires if it is not exercised within the time period allowed. The expiration date is the last day on which the option can be exercised. Options expire in the month prior to contract delivery. 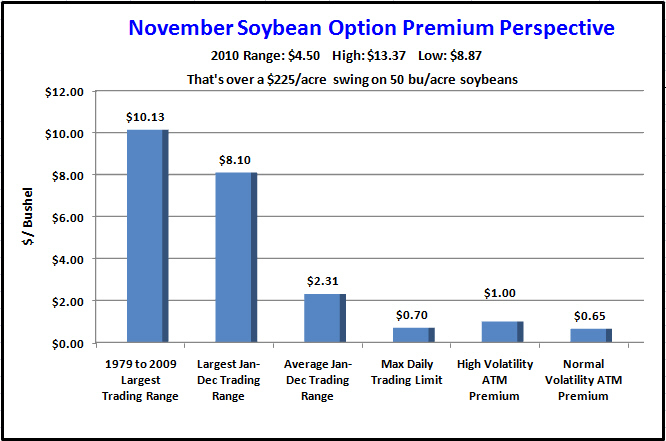 For example, a November soybean option expires in October. These graphs are used to help put the value of an option into perspective. When we compare the contract trading range or calander year trading ranges to the value of an option we see that the option premium is usually a fraction of the trading range. 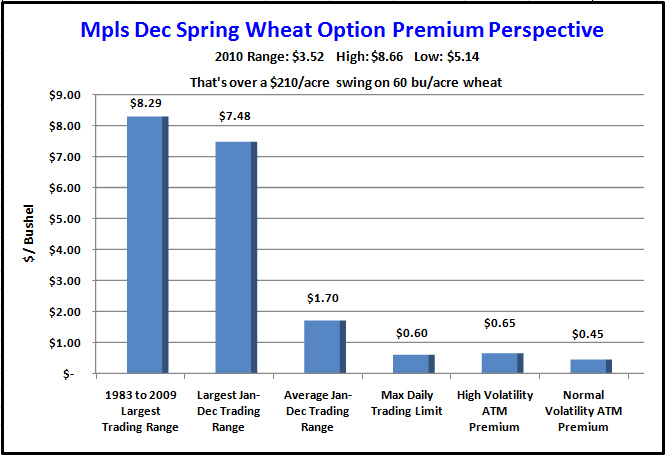 Options are a good fit for price protection for a growing crop that we are not willing to forward price. It could be that we expect higher prices, are unsure of the expected yield, or have already sold to our comfort level. For example, If we are not ready to sell and are fearful of declining prices we can buy a put option.